PM Modi branded the earlier government (Siddaramaiah's) as a "10 per cent commision" government, but now with Congress and JDS joining hands, it had become a "20 per cent commission government." PM Modi also asserted that there was a wave across the country favouring the return of BJP. In a scathing attack on the Congress-JDS government in Karnataka, Prime Minister Narendra Modi on Friday dubbed it as a "20 per cent commission government." 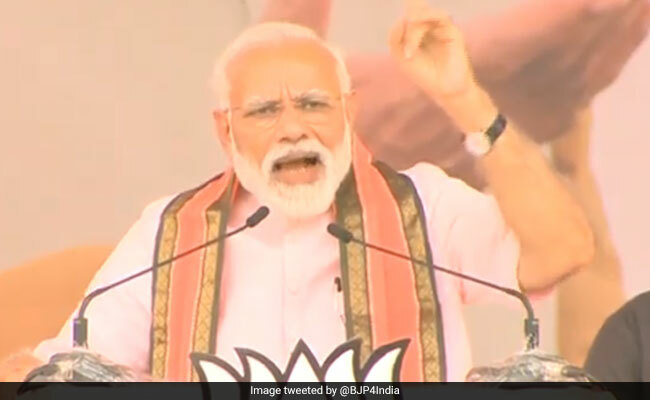 Addressing a rally in north Karnataka, PM Modi said the Congress-JDS coalition's "only mission is commission", attacking it on the issue of corruption. PM Modi also asserted that there was a wave across the country favouring the return of his government. "Phir Ek Bar...." PM Modi said, and the huge crowd roared in approval saying, "Modi Sarkar". The Prime Minister also drew huge applause when he spoke in Kannada towards the end of his speech, hailing every strata of society and asking them to say ''Chowkidar''.